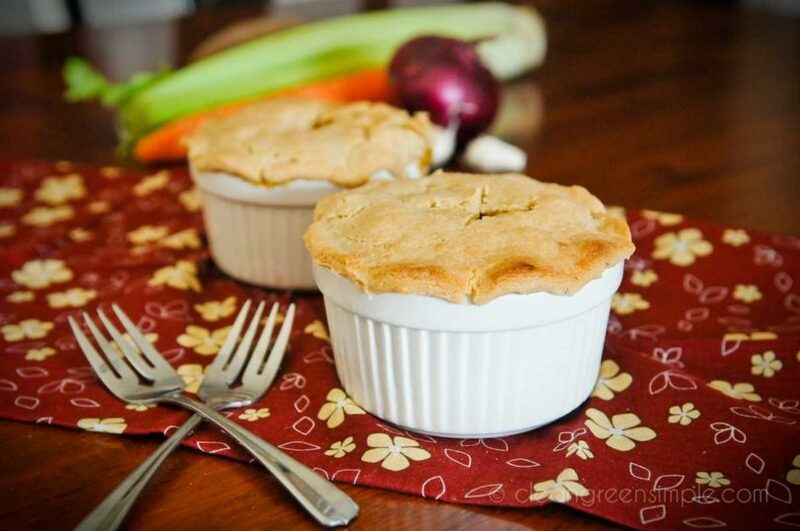 Delicious vegan, gluten free pot pie – comfort food at its best! There is really no reason this should have worked. I have made maybe half a dozen pie crusts in my life and really don’t bake often enough to be able to just wing it – and if you add trying to make it gluten free then it’s really unfamiliar territory! I just wanted to make a vegan, gluten free crust for my pot pie, but a quick google search only came up with recipes that had fake butter or shortening in them or which involved like 30 ingredients and a million steps. There’s probably lots of awesome recipes out there, but I wasn’t finding them, so I decided to see how I fared making up my own. And it worked! This was such a good crust! 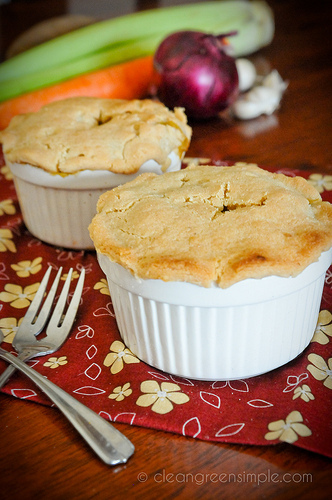 Flaky, flavorful, and just perfect with this veggie pot pie filling. I can’t guarantee that it would work for a whole pie or anything else yet, but I will definitely be using this recipe more in the future so I’ll keep you posted. Then just sauté those in a medium pot until softened and add some water or broth, a bit of corn starch (or potato starch) and let it get nice and bubbly and thick. While that heats you can mix together your dough (Tee hee! I’m still so psyched that my recipe worked!) – it involves a couple different types of GF flours (Amaranth, Potato Starch, White Rice Flour, and Arrowroot) but they are all fairly standard in gluten free baking and most health food stores will have them. Aside from that, it couldn’t be easier – just mix your flours together with a bit of coconut oil, some canola or other neutral oil, a bit of apple cider vinegar, and some water. It doesn’t even have to be a particular temperature, I just used cold filtered tap water. Blend it all with a fork or your hands until you get a cohesive ball of dough that you can turn out onto a cutting sheet or clean countertop. Roll it out gently (I didn’t even use a rolling pin, I just sort of spread it out with my hands, but you can do it however you prefer) and then cut a circle of dough that is slightly larger than the dish you’ll be serving the pot pies in. I used 3.5 inch ramekins for mine and then in my usual lazy fashion simply cut the circles using a slightly bigger bowl I had around. The dough is fairly easy to work with but it is a bit delicate, so when you go to lift your dough circles you might want to enlist the aid of a wide flat spatula to gently transfer them from the cutting board to the top of your pot pie dish. 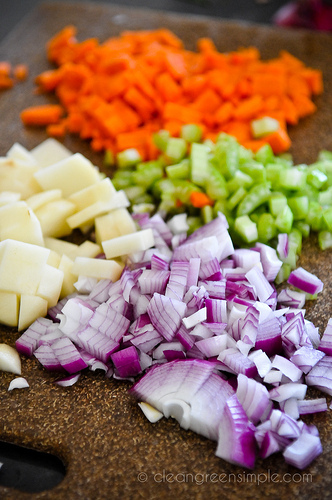 Speaking of that, your veggie mixture should be ready now! 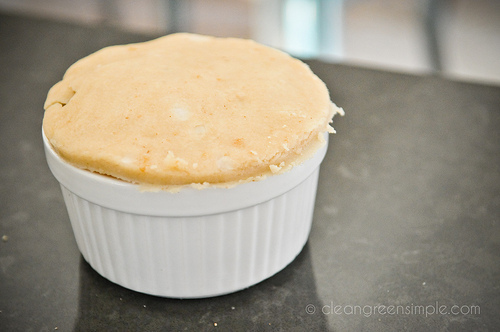 Fill an oven safe dish or ramekin until it’s pretty full – you want to have it heaping a bit so your dough doesn’t sink in. Not that it really matters, but it just seems prettier for the dough to have a nice upward curve to it, doesn’t it? Repeat with the rest of the filling and dough, and then set them on a cookie sheet and bake them at 350 for about 15-25 minutes. Since the filling is already pretty cooked you’re really just going off of when the crust is done, which will vary depending on how thick you made it. You’ll know it’s done once the surface starts to crack a little bit and it’s a very light golden brown. Now just let it cool and enjoy the comfort food goodness of homemade pot pie. But, you know, without the eighty bajillion calories it usually has. I would happily serve this to my gluten eating, non-vegan friends, it’s so darn tasty. 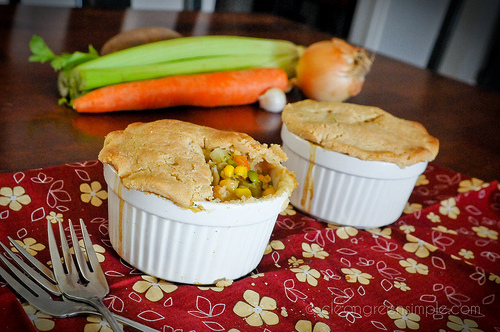 Individual-Sized Veggie Pot Pies (Dairy Free, Egg Free, Gluten Free, Soy Free, Sugar Free). This makes about 4 servings, depending on how big your serving dishes are. The vegetables for the filling are fairly flexible - just use whatever you have that sounds like it would be good in a pot pie! 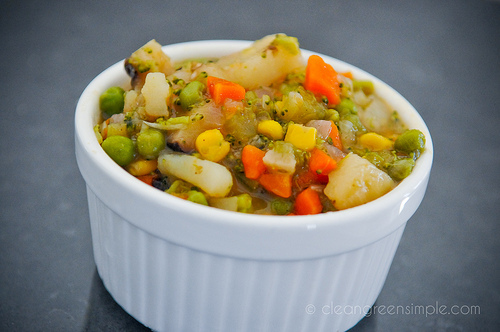 To make the filling: Sauté potato, carrot, celery, onion, corn, mushroom, broccoli, peas, and garlic in a medium pot until softened. Add water or broth and whisk in corn starch. Add bay leaf, oregano, salt, pepper and red pepper flakes and heat, stirring occasionally, until sauce is thickened and bubbling. Remove from heat, remove the bay leaf, and fill your serving dishes with 1/4 of the mixture in each. To make the dough: Preheat oven to 350°. In a large bowl, stir together Amaranth, White Rice flour, potato starch, salt, and Arrowroot. Add in coconut oil, canola oil, apple cider vinegar, and water and mix with a fork or your hands until a cohesive dough ball forms. If necessary you can add a bit more water or amaranth to make it more wet or dry, as needed. 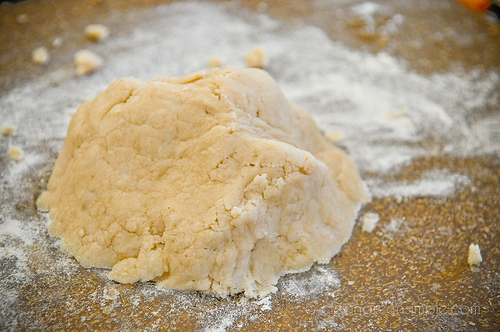 Roll the dough out on a smooth clean surface into a 1/4 inch sheet. Cut out circles slightly larger than your serving dishes. Using a wide spatula, transfer your dough circles onto the top of your filled serving dishes. Gently press your finger around the edge to create a wave, if desired. 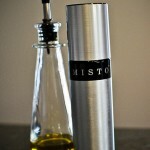 Brush a thin coat of olive oil over the top of the crust and bake at 350° for 15-25 minutes, checking every few minutes to make sure it doesn't burn, until surface is slightly cracked and a light golden brown. Let cool for a few minutes and enjoy! Awesome! Great idea for my dinner tonight! Wonderful! 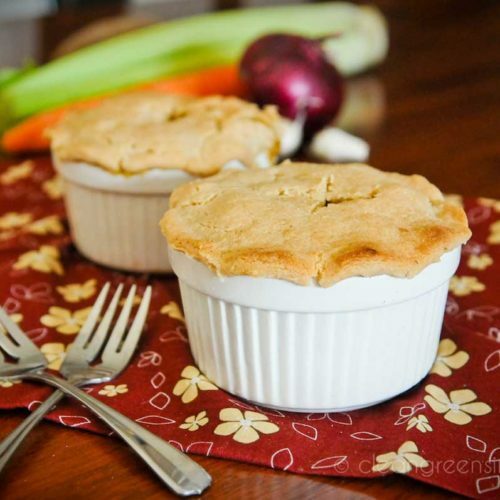 Gluten-free pot pie!! Thanks for the recipe!! What if I don’t have the starch? Could I add more of other flour. And guar gum for the arrowroot?? Hmm. I would try replacing the potato starch with maybe 1/4 c. corn starch and 2 Tbsp brown rice flour. And you could probably skip the arrowroot. But I can’t guarantee that would work, like I said I’m not really an expert 🙂 Let me know if you try it how it turns out! These look delicious! 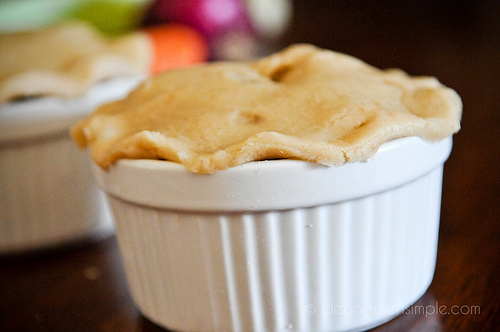 I’m linking up to this in my pot pie recipe post that I’ll have up tomorrow. I’m looking for a really good gluten free pie crust recipe. The one’s i’ve tried have been ROCK HARD and disgusting (generally the ones with bean flour). I’m just wondering if this is tender and flakey like a wheat crust? Will it roll or am I going to be cursing it as it crubles to a mess on my kitchen floor!? Comments? I’ve been looking for a long time …. I’m exhausted! So, so, so good! Thank you for you wonderful recipes! It’s evident that they’re all incredibly well-thought out and well-prepared. Fabulous! I made a different filling with the veggies I picked up at my local farmers’ market, and made a double batch of your crust for it. I rolled it out super gently between sheets of parchment, half the batch at a time, then flipped the parchment over the baking dish. I think you were probably so successful precisely because you didn’t have a lot of experience with (and preconceived notions about) pastry. I forget sometimes that all my years of baking with wheat and butter are only relevant sometimes – and this was NOT one of those times! I have made three pecan pies and two big 9×13 pot pies in the last 24 hours and I can tell you that a) I am really full of pie and b) the ones that worked best were the furthest from my experience with traditional pastry! Your crust worked great here. The edges which weren’t touching filling got hard, but the parts that were touching filling were tender, flaky, delicious! I hope it holds up just as well for reheating. Fingers crossed! The two pecan pies that didn’t work as well I made using techniques closer to what I used to do with wheat and butter, only substituting the GF flours and vegan oils, of course. The pecan pie that worked ended up being in an almond flour shortbread style crust based on the one in Elana Amsterdam’s GF Almond Flour Cookbook. I gave up on rolling out crusts for that! Both rolled crusts I tried for the pecan pie got hard and tough. The almond shortbread crust ended up a little oilier than I would like, but tender and tasty! Next time I will change it up just a little again, but not much! Jessica, I’ve been looking for a great vegan, gluten free pie crust recipe for ages. This certainly looks good and reassuring to hear it is flaky! Am I able to substitute the amaranth flour though for something that is easier to get hold of in the UK? And is this recipe enough for a medium quiche dish? Brilliant! Thank you for a fabulous recipe, I can’ t wait to try it! 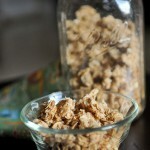 Has anyone tried making it with a creamy mixture? Like coconut or almond milk? I am desperately trying to satisfy a husband who needs to eat vegan for his health but misses all his rich comfort foods!